I Live In A Fictional World: Name Your Top Vamps! After reviewing The President's Vampire this week, I starting thinking about the toughest vampires I've read and I thought it'd be fun to share my Top 3 and why. I decided to narrow it down to three because, frankly, I felt these three were in a league of their own compared to the others on my shelves. I'd really love to know who your top 3 (or 5) toughest vampires are! 1. I have to start with Nathaniel Cade from The President's Vampire. He is unstoppable. Whatever monsters come at him are struck down. He's lightening fast, super strong, fearless and no longer thinks, feels, behaves or does much of anything like a human. You know what that means? He's an animal. A beast. Controlled, maybe. But never tamed. 2. The Twilight vampires. Haters can say what they want, but they were invincible; fast, strong, they walk in the sun and they never sleep. Even Cade had to go to ground or risk burning in the sun. I can't think of a single thing that could hurt them aside from the werewolves and other vampires. 3. This last vamp may be the baddest of them all. Sita of Thirst No. 1, 2, 3 and 4. She can see the craters on the moon. Imagine how enhanced everything else is after 5,000 years. You can't surprise her. She can smell the gunpowder in your bullets and the steel of the gun before you even pull it out. Her senses don't miss a thing. She can't be killed. Indestructible is the word I'm looking for. So those are three of my favorite vampires though I love all of them. Who are yours? Maybe you think it's Rose from Vampire Academy or Eric from the Sookie Stackhouse novels, or one I've never even heard of! 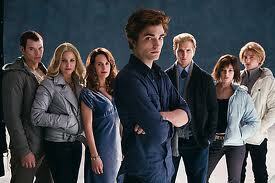 I also agree with the Cullens. Before them I loved Angel and Spike, from Buffy the Vampire Slayer, yes, from the books as well. And I like Eric. And of course Lestat from Interview with the Vampire. And does Bunnicula count? :-) I need to read the President's Vampire too.